Hartford raised two rounds of General Obligation debt in the fourth quarter of calendar 2014. A press release issued by Treasurer Adam Cloud about the pair of bond offerings stated that the City received “its lowest borrowing cost in decades” at an effective interest rate of 3.11%. The chart below compares the City’s scheduled annual debt payments (principal plus interest) before and after the debt issue. The green bars in the foreground show the debt profile as of June 30, 2014, while the purple bars in the background show the debt profile as of October 31, 2014. The purple tops of the bars show the amount of this issue to be repaid in each fiscal year. Payments were extended by two years, and about $6.5 million in annual debt service was added to fiscal years 2017 through 2035. 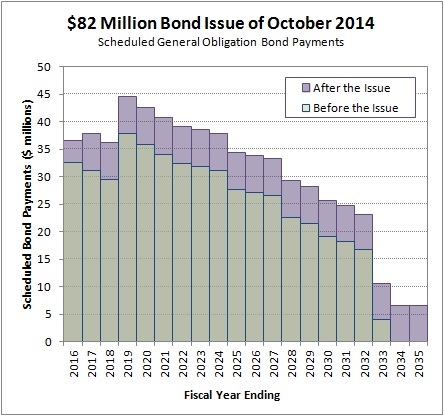 If the bonds were held to maturity, the City would repay $130.8 million over 20 years.